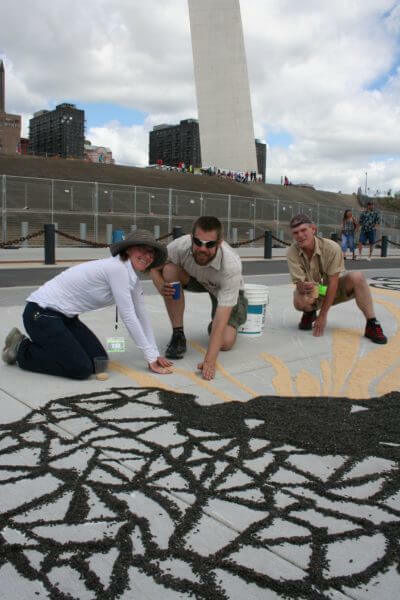 Artist Jessica Witte and her husband, Brad Witte, work on the art project “Seed the Change” with Matt Bird (on right) below the Gateway Arch. The theme is about bringing people together to make a positive change in their environment. Jessica Witte, M.F.A.’04, is a nationally exhibited and award-winning artist. She also describes herself as a recovering control freak. Witte is far from controlling these days as she makes a name for herself in the St. Louis art scene. In early June, she headed a massive public art project along the riverfront below the Gateway Arch. She and her crew drew abstract chalk outlines of Missouri’s native wildflowers, such as the hawthorn and coneflower. She then invited passersby to take control and fill in the outlines with birdseed as the medium and the sidewalk as the canvas. Time lapse video recorded adults and children sprinkling the designs with nearly 1.5 tons of contrasting millet and sunflower seeds to help the city celebrate the transformation of the Arch grounds. While the birdseed art was fun for the public, Witte viewed it as an example of how people affect each other. “The changes that occur as people walk through, add to, and shift the drawings are a visual metaphor for how others influence our output,” she says. The art also symbolizes a movement in St. Louis to advocate for backyard wildlife habitats and to help fight the loss of pollinators – bees, birds, and butterflies. Local organizations, such as the Missouri Botanical Garden, partnered with Witte to provide hands-on activities to make the public aware of the importance of growing native plants, composting, and other environmental issues. As part of the movement to give back to nature, the birdseed from the art project was swept up and rebagged for the public to take. Witte also donated 250 pounds of unopened bags of seed to the World Bird Sanctuary in Valley Park, Missouri. Witte’s project was funded by a $10,000 grant from Critical Mass for the Visual Arts, which selected Witte from three finalists. Witte won over the group with her “Seed the Change” idea, which refers to positive changes happening in the city because of organizations and communities working together. “The purpose was really to create a beautiful threshold for the city of St. Louis, calling attention to the work that CityArchRiver is already doing to make the city a better place through design,” says Witte, a resident of Creve Coeur, Missouri. 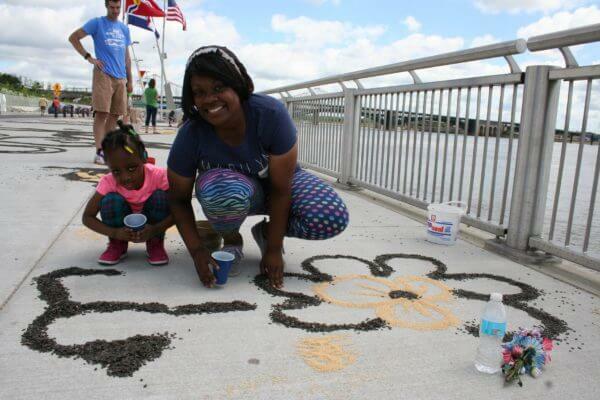 Salina Govan of St. Louis and her daughter, Kristyahna Bradshaw, help decorate the Gateway Arch riverfront with birdseed art. CityArchRiver 2015 is the name of the St. Louis project to transform the grounds surrounding the Arch. Biking and running trails, space for outdoor concerts, and a new museum commemorating westward expansion are all part of the plan. The Arch remains open during the renovation of its visitor center and Museum of Westward Expansion, both scheduled to reopen in 2017. For the last decade, Witte has created large-scale drawings on the ground – referred to as “birdseed doilies” – and she tends to include floral and lace elements in her work. The fragile doilies are meant to celebrate labor and maintenance. Her multimedia art has been featured in more than fifty exhibitions at venues such as the San Diego Art Institute, the Textile Center in Minneapolis, the Museum of Nebraska Art, the Rockford Art Museum, Chicago art galleries, and the Good Citizen Gallery in St. Louis. Early on in her career, she says, it was painful to watch her temporary art exhibits get destroyed. But now she enjoys acting as an orchestrator and watching the crowd create the installation art. “It became more about seeing what other people could contribute and working with that on the fly to make something bigger than myself,” Witte says. As a graduate student at Northern, she began doing installation and performance art and incorporating food in designs. She remembers professors Christine LoFaso and Billie Giese of the School of Art and Design influencing her work. LoFaso told Witte that the doily work set her apart, and Giese suggested videotaping the process. NIU helped Witte, who began as a printmaking major, embrace an interdisciplinary approach to art making, Giese says. Witte is now moving on to expand her ideas as an artist and continue making positive changes in St. Louis. She is applying for the highly competitive Artist in Residence Program of Forest Park Forever, which works with the city of St. Louis to restore, maintain, and sustain Forest Park as one of the greatest urban public parks in America. Watch the time lapse video here.